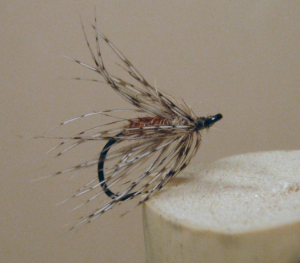 The traditional soft hackle fly has been with us for a long time. Sylvester Nemes in his Two Centuries of Soft-Hackled Flies (2004) chronicles the history of this venerable pattern back to the year 1747. Even today, in the 21st century, the soft-hackle is a killer pattern that can be effective anywhere trout feed on aquatic insects. Unfortunately, many fly shops don’t carry them and even online retailers don’t offer the variety one would like to see. Additionally, it’s hard to justify paying $2 for a fly on a cheap hook that can be tied in less than a minute or so on a good one. 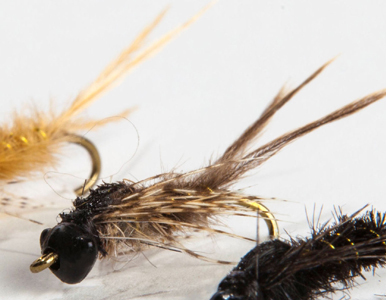 Trout anglers should always have a good selection of soft hackles at the ready anytime they fish in insect rich waters (they are actually very effective for bluegill and other shallow water sunfish). This entry was posted in Fly Tying Materials & Supplies, Fly Tying Tips & Tools, Mike Cline, Bozeman MT, The Art of Fly Tying and tagged fly tying, fly tying materials, Mike Cline, soft hackle fly, soft hackles, trout fishing on October 31, 2014 by Mike Cline, Bozeman, MT. Flymen Fishing continues to expand their innovative line of fly tying products. And, just in time for tying season, their NEW Evolution™ Tungsten Beads are available in a variety of styles, sizes and colors. Flymen is introducing a series of new flies featuring these new beads including the Evolution™ Mayfly Swimmer. This effective mayfly pattern is inspired by Shane Stalcup’s Gilled Nymph and imitates many gilled swimming mayfly nymphs. It is tied using a modern hare’s ear plus dubbing and an Evolution™ Mayfly Swimmer & Burrower Tungsten Bead Head. This entry was posted in Fly Tying Materials & Supplies, Fly Tying Tips & Tools, The Art of Fly Tying and tagged evolution tungsten beads, fly tying, fly tying instructions, fly tying materials, Flymen Fishing, mayfliy swimmer on October 28, 2014 by J Stockard. This entry was posted in J. Stockard Fly Fishing News, The Art of Fly Tying and tagged casting for recovery, CfR, fly tying, fly tying materials, pink wooly buggers on October 23, 2014 by Bob Nelson.